The world of wireless is dragging us into the 21st century kicking and screaming. Our treatise on NFC was a great sneak peek into how our future will play out over the next five years, but we're also seeing other types of suave new tricks coming out as short-range wireless technology creeps closer to the mainstream. Wireless is the crux of convenience that will keep us calm enough to make our way through this speed-demon culture. It didn't take long for our quest to obtain simpler and faster everything to become an obsession, and it shows no signs of stopping; on the contrary, it's only speeding up exponentially at a rate even manufacturers have a hard time keeping up with. Wireless charging is making some serious headway in public mindshare. Once confined to toothbrushes and other simple household items, it's now a handy means of powering phones (HP's Touchstone, for example) and media players, and it'll soon be ready to charge up our notebooks and cameras at our command. Are we sure this is the future, or will this just be a passing fad? Why should it matter? Read on after the break to get the air-conditioned answers to those burning questions. Where can inductive charging take us? Besides inductive charging, what else is there? The principle of wireless charging has been around for over a century, but only now are we beginning to recognize its true potential. First, we need to be careful about how liberal we use "wireless" as a term; such a word implies that you can just walk around the house or office and be greeted by waves of energy beamed straight to your phone. As Space Age-ish as it sounds, that kind of stuff actually is in the works, but it's still a long ways from getting to market -- and even further from turning into a mainstream solution. So for the universe as we see it today, the word merely refers to not using cords. Ginormous difference. We're referring, largely, to inductive charging -- the ability to manipulate an electromagnetic field in order to transfer energy a very short distance between two objects (a transmitter and receiver). It's limited to distances of just a few millimeters for the moment, but even with this limitation, such a concept will allow us to power up phones, laptops, keyboards, kitchen appliances, and power tools from a large number of places: in our homes, our cars, and even the mall. And that's just for starters. Sounds so 21st century, doesn't it? We've seen this "advanced" technology in elementary gizmos like electric toothbrushes and shavers for decades, but it wasn't until 2009 when companies like Palm and Powermat began generating a fair amount of public interest for some of our everyday devices. The major drawbacks so far? The cost of the accessories are almost as much as the phones themselves; they've typically involved bulky cases that barely fit into your pocket, and even now are compatible with very few devices. This isn't always going to be the case. We're starting to notice a rapidly growing trend heading directly into cord-cutting. In the last year we've witnessed tremendous breakthroughs in clever services like "the cloud," mobile devices syncing media and backups via WiFi, and NFC. Bluetooth, as another example, has been around for a much longer time but is still increasing in popularity. With such ideas rapidly becoming not only reality but commonplace, wireless charging now has some serious clout with Joe the Plumber. The three handsets on Verizon's LTE lineup now offer dedicated back covers to lead the charge (pun intended) to general consumer acceptance, and dozens of other companies are working to integrate inductive charging surfaces into everyday items like furniture, desktops, or the middle of your car. This tremendous opportunity extends into so much more than just phones, but you have to start somewhere, right? In a nutshell, inductive charging involves a surface that acts as the transmitter, with coils built-in underneath to transfer energy to a willing receiver. This could be a phone, laptop, a can of soup. There's intrigue in this type of charging because as long as you have the proper sleeve or battery cover attached, you can easily charge your gizmo just by placing it on a compatible pad. And maybe -- just maybe -- we won't always have to rely on additional (and typically bulky) accessories to make this happen. It's a great idea, but one reason why this wireless tech has been restricted to nothing but a glorified conceptualization (until recently, anyways) is because no standard had been set. Each company was left to fend for itself, coming up with its own proprietary accessories for individual products. The bill of materials can rack up quickly when there's no standard and no interoperability, so how can such a ragtag operation really succeed? Enter the Wireless Power Consortium (WPC), the masterminds behind Qi (pronounced 'Chee'). Sound familiar? If so, that's probably because it's getting into everything. Qi is a set of guidelines for inductive charging units that WPC is hoping will become the universal standard. It's rounded up 84 manufacturers, semiconductors, and telecom providers under its wing so far, a number which no other organizations have come close to matching. Qualcomm and CEA are still busy nailing down their own standards, both of which are set to hit the market sometime this year, so Qi is the current default. Even when the WPC finally has official competition, it's got an astronomical head start. With so many businesses hopping on the bandwagon, this leaves more room for innovation and specialization of products. Interoperability of this magnitude can offer a large number of benefits: it's easier to market a product when you're backed up by an established protocol that everybody else uses, and the cost to consumers is much lower to get set up since everything is compatible. In a niche market, proprietary (or standalone) product lines are much more difficult for consumers to get behind. But once the vast majority of legit tech companies -- Samsung, HTC, Motorola, Energizer, Nokia, and Sony Ericsson are among WPC's list of members -- begin integrating Qi into phones, laptops, DSLR cameras, keyboards, kitchen countertops, and furniture, chances are you're a lot more tempted to buy a Qi-compatible product than something from a random yahoo. Think about it this way: we'd be much more inclined to board a train if it already has a destination, passengers, and enough manpower to get somewhere, rather than one that's empty and just sitting around waiting for people to show up. The Qi train looks entirely more salacious. 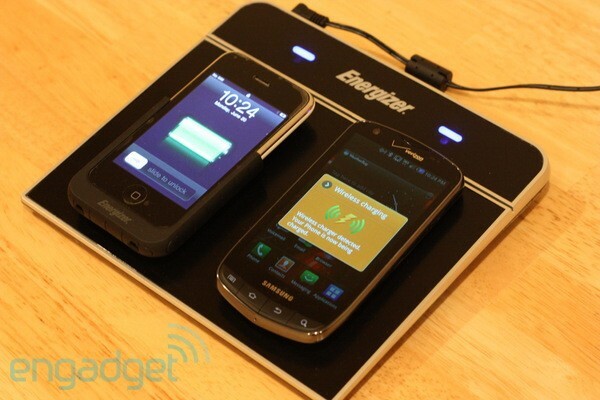 Our earlier video and the image above will hopefully demonstrate why interoperability matters; we were able to take an Energizer Qi-compatible charging pad, and use it to power up both a Samsung Droid Charge (with the inductive battery cover attached) and an iPhone 3GS with the Energizer sleeve. It doesn't matter which company made the product, any item that's Qi-certified will do the trick. The WPC set certain guidelines for Qi because it not only wants to keep everything compatible, it's also ensuring its members will comply with certain safety rules, software guidelines, and other procedures that make it the most efficient charging option available. When your phone is plugged into a standard wall outlet, it's still soaking up way too much power even when the battery is full. Qi has set a guideline to cut the consumption levels down in this case. As a side effect, however, this method limits the amount of power transfer taking place even during a regular charge, which means it takes a bit longer to power something up completely. Fortunately, the transmitter and receiver can even send data to each other to determine if a battery is full and needs to stop charging. There are other useful ways Qi devices can take advantage of this ability, which we'll touch upon shortly. When the standard was established last year, the WPC came out with only one power setting for Qi: low. With a maximum power output of 5W, the low standard's only enough to power the smaller gadgets -- phones, media players, and anything else that doesn't require much of a charge. The medium setting, currently in the works, will take care of anything in the 5W - 120W range like notebooks, netbooks, tablets, and cameras. According to Pavan Pudipeddi on TI's battery management solutions team, it's taking longer to get this standard wrapped up, due to a conundrum that's taking extra time to solve: the difference between 5 and 120 is substantial, so how does a Qi surface tell between tablets (that require 25-30) and power-hungry notebooks (65-90)? WiPower: This standard under development by Qualcomm involves near-field inductive charging with flexible couplings, so that it can transmit up to two inches (compared to Qi's few mm distance). It can also cover an 5- x 3-inch area so that multiple devices can fit on one square, rather than requiring one coil per device. The longer distance will be a strong advantage for WiPower, as it means you'd just have to stick a coil underneath a table or desk instead of taking Qi's method of integrating it directly into the surfaces -- a much more expensive approach, to be sure. This standard also offers a more flexible range, so you can take your laptop and move it around a little without it being stuck on your desk in one specific spot. Once it launches, it could prove to be a worthy adversary to keep Qi from floating away with the "Universal Standard" trophy. UL: Underwriters Laboratories announced last year that it was building its own low-power inductive charging standard called UL 2738. Catchy name, right? There's a tricky thing about this particular standard -- it will be mandated. This may sound like a familiar idea to you; if you've taken a close look at power supplies or light products, you may have seen a UL label printed somewhere on them. The standard is wholly safety-based, which means it's completely separate from the other protocols. Fortunately, everyone can co-exist with the UL in perfect harmony. We can't stress enough how crucial this is to paving the way to the tech's future; wireless chargers that need mandated certifications from the UL are a huge indicator that there is a very strong interest in this type of service becoming mainstream, available on every street corner. CEA: Similarly, the CEA created the Wireless Charging Working Group to begin work on its own standard, which should be ready to be submitted to the CEA management board by the end of this year, and then on to get approval from the IEEE. Its guidelines will be much broader in scope than the WPC and include a wide range of technologies. Also, in a similar fashion to UL, this particular standard will be inclusive of other protocols, and several members of the WPC -- such as Qualcomm, Intel, GM, Powermat, and Motorola -- have joined with this working group. As a side note, we could only find one company that has pledged support and membership with all four major protocols: Powermat. This won't mean its products will change from its proprietary charging method and become universal per se, but it does opens up the door for it to work in conjunction with these protocols and partner with multiple manufacturers. It also offers the company additional flexibility if any change in strategy is necessary. A huge point of concern when developing these kinds of standards is how it will affect our health. When thinking about wireless, it's easy to envision radioactive waves zapping us as they float around in the air -- and we have every right to know if this type of charging will cause us any type of harm. In the case of inductive charging, however, we won't need to worry about trying to duck the attack of invisible rays. The WPC established guidelines to ensure its products won't expose us to levels of radiation or ionization that could cause any harm to human tissue. As an example, the WPC quotes the ICNIRP, a scientific committee that has published its own guidelines on exposure limits. It states: "there is no substantive evidence that adverse health effects, including cancer, can occur in people exposed to levels at or below the ICNIRP limits." According to the studies conducted by this committee, so long as Qi and the other standards see to it that products don't exceed the max exposure, we shouldn't be concerned. Check out More Coverage at the bottom to get more details on these studies. 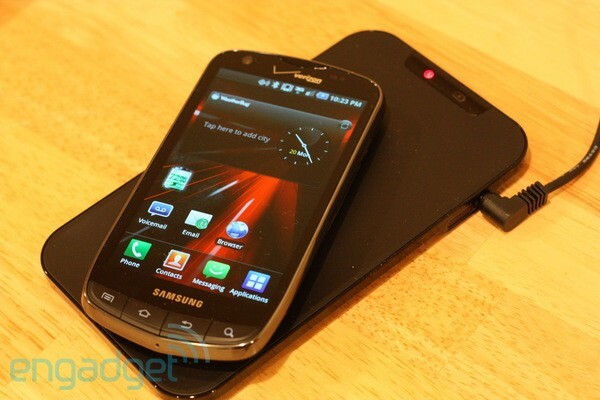 In the here and now, all inductive charging seems to do is come up with a clever way to power up our phones. But looking past the immediate horizon, there's a whole new universe of possible ideas on how to add convenience to our lives. Just the fact that these transmitters and receivers could send data -- not just energy -- back and forth to each other opens up a myriad of opportunities. Let's break some of these ideas down. Use your Qi-compatible kitchen counter to power your George Foreman grill, a blender, or boil a pot of water. The sensors in the counter work to keep the pot boiling, even though the surface itself is cool to the touch. If the pot needs to boil for ten minutes and then simmer for two, you'll be able to program it to do so without need for manual adjustments. Grab a can of soup and place it on the same inductive countertop. The can has an embedded receiver; once it heats up to its desired temperature, a light on the can flashes red, indicating that it's ready to eat. Integrate Qi charger pads into the desktop in your office or study, and use them to power up your computer monitors, keyboard and mouse, and DSLR. As your camera charges, it sends a signal telling the Qi to commence syncing your images via WiFi to your computer. Install a puck-sized Qi charger into your furniture, and use it to power up your Kindle or tablet as you get more and more engrossed in your latest novel. Courtesy of Powermat, several 2012 models made by General Motors will have wireless charging pads embedded somewhere inside the car for easy access, such as the center console or right in between the front seats. There's a good chance we'll begin seeing Qi-compatible charging pads built into specific cars as well. 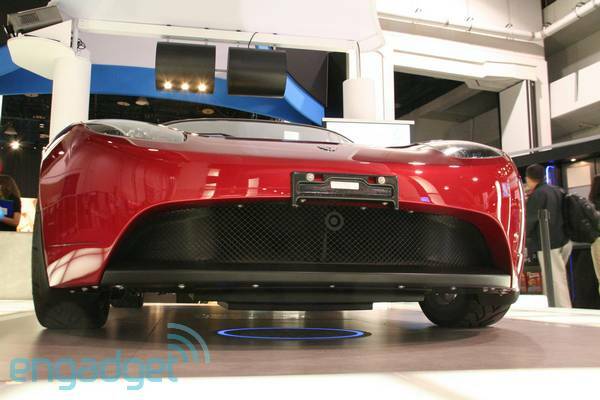 As demonstrated by Fulton Innovation at CES 2011, we may also begin seeing electric-powered vehicles get powered up via a manhole-sized charging pad. Not only would this be great in your garage, you'd also be able to top off your car's battery in special parking spots at the mall or other public venues. With these, you'd pay a certain rate to charge your car as you finish your shopping or grab a bite to eat and control these payments through a smartphone app. When shown off in January, Fulton claimed this form of charging was 80 percent efficient at the time, and with some adjustments this number could get bumped up to as high as 89 percent. This isn't too bad, compared to the 96 percent efficiency seen in wired cars. Imagine a conference room in which the table is hooked up with Qi. Every person's laptop can be getting fully charged during the presentation, eliminating the need to have several surge protectors or power outlets scattered up and down the room with dozens of accompanying cords. One seat at the head of the table would be set up to control the projector; the presenter sets his or her laptop on this charging point and it mirrors the computer screen onto the projector. At the grocery store, you tell a smartphone app which items you need to pick up. The app not only shows you which aisle it's located on, each product would sit on top of a Qi pad that triggers an electrolumiscient label on the item, lighting it up as you approach it. This could be done with any item for any reason -- if a product is on sale, for instance. There's a whole lot of great marketing opportunities available thanks to inductive charging units. Milk could flash different colored labels when it gets closer to (and eventually reaches) its expiration date, making it much easier for employees to identify and get rid of it. If you're heading to the coffee shop, chances are you're bringing your laptop or tablet. Having charging pads embedded into the tables will keep you from lugging extra cords around, leaves extra room for you (and others) to enjoy, and keeps others from tripping on your wires. Your lawyer will thank you. The same goes for airports, where Qi is already starting to get integrated into seats and tables. If you've done a fair amount of traveling, it's no secret that open outlets are the airport equivalent of a unicorn, so adding extra places in the terminal for us to charge our phones and laptops wirelessly will be a huge incentive to buy. And just to take things a step further, how wonderful would it be to take your netbook onto the plane with you and have a way to charge it up wirelessly during the flight? A lot of these scenarios sound incredibly tantalizing, but we're likely still at least a couple years away from experiencing most of them. Some may never even happen at all, and others are actually ready to go (Powermats are already installed in a few airports, for instance). Regardless, we're going to see a huge spike in interest over the next two years because standards will have been finalized, manufacturers are starting to embed these types of chargers in their products, and we'll begin noticing Qi logos popping up in airports, cars, and coffee shops. It's basic marketing: the more visible it is to the public eye, the quicker it will be adopted and accepted. To be honest, we're not going to see as much value in forking out all this extra cash just to charge our handheld gadgets in a cool way, but the trend has to start growing somewhere. Phones and media players are the natural places to begin because it's a low price point that has high market saturation potential, which will help the average Joe / Jane become informed. Wireless charging units won't be too expensive to integrate directly into handheld devices -- at least, once it starts picking up speed and more units get ordered. It'll be a different game when a multitude of Qi-compatible consumer products flood the market and significantly reduce the manufacturing cost. We get it -- inductive charging may not be so exciting, especially right now as it involves clunky sleeves and other expensive accessories. While standards such as Qi and WiPower are sure to improve power efficiency and cost as they continue developing, there will always be the limiting factor of short distances. That's fine for kitchen appliances and desktop computers, but let's face it: for phones and other handheld devices, it doesn't really add that much extra convenience to our lives if we can't actually pick them up and use them while they're getting charged "wirelessly." Magnetic induction is a step in the right direction and has the capability of doing all the things you read about above, but it can only take us so far. Several other methods of wireless charging are currently in development, however, all of which can transmit varying degrees of power over longer distances. WiTricity: Originally founded and designed by a team at MIT in 2007, WiTricity relies on long-field magnetic resonance to transfer energy over much longer distances than induction. Instead of millimeters or inches, it has the ability to stretch out as much as eight feet. While some efficiency is lost as you move further away from the power source, it still exceeds 95 percent power efficiency for devices within a couple feet. Toyota announced a partnership with WiTricity in April to begin working on using this longer-distance resonance technology to power up its vehicles, but no timeframe was set on when this capability may be available. 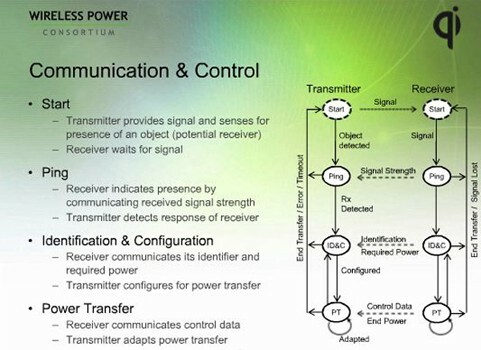 Powercast: Using a creative technique to take advantage of radio waves, Powercast has found a way to grab RF transmissions and convert them into DC power. The idea is to install a transmitter somewhere in the house that broadcasts RF energy in the 850-950MHz range, which an embedded sensor can pick up and convert into a trickle charge from up to 40 feet away. It can also technically grab any other errant RF waves that happen to wander by. The shortcoming here is that government regulations limit the amount of power that can be emitted using RF to 3-4W, which restricts its use to more low-power applications like humidity and light sensors, keyboards, flashlights, and GPS modules. The trickle charge that Powercast transmitters use would be too little for power-hungry devices. Powerbeam: This alternative uses optical "beams" to transmit energy wirelessly up to 40 feet away. Much like Powercast, the amount of energy that can be transmitted currently is around 5W, so it's great for powering up lights, security cameras, digital picture frames, and other smaller devices. It technically can charge devices up to 10W, but don't plan on using this tech for anything larger than a phone or tablet -- not efficiently, anyway. It's great for putting objects in hard-to-reach places that you wouldn't have otherwise considered; however, one huge disadvantage is that since it involves a beam of optical energy, it doesn't go through walls, and the power gets cut off if an object moves in between the transmitter and receiver. Still, this would definitely come in handy for large rooms. RCA Airpower: Very little information has been brought to light in the past year about this particular technique, but RCA has been said to be working on a wireless charging solution that could grab and harness the little bits of WiFi energy floating around and convert it into power. If this does come to market, we'd likely see it first come out in portable chargers. There are tons of creative ways we can power up all of our portable gear. Due to limitations and inefficiencies, most of these techniques wouldn't see the light of day for anything that requires anything more than a trickle of power, but the hamster wheels are turning now and we imagine this is only the beginning of what the cunning mind can come up with. Wireless charging is coming, and we absolutely love what the future holds for us because of it. The real potential, however, lies beyond just placing phones on nifty pads. As a first-gen service, the existing equipment is too expensive and there's too many bulky parts to go along with it; once it's developed and proven, however, we'll barely remember how we even lived when we were restricted to cords -- after all, those things were so 2010.